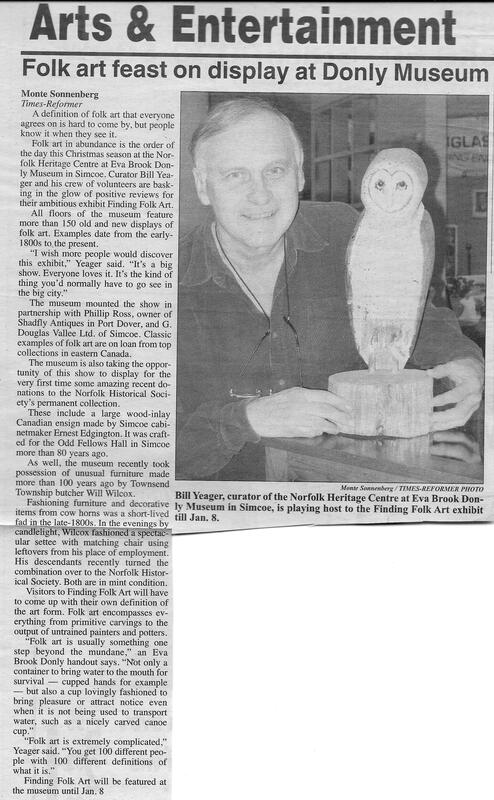 Last week I noticed this small article posted twice to Facebook by two different renowned Quebec antique dealers Michel Prince and Karin Belzile. 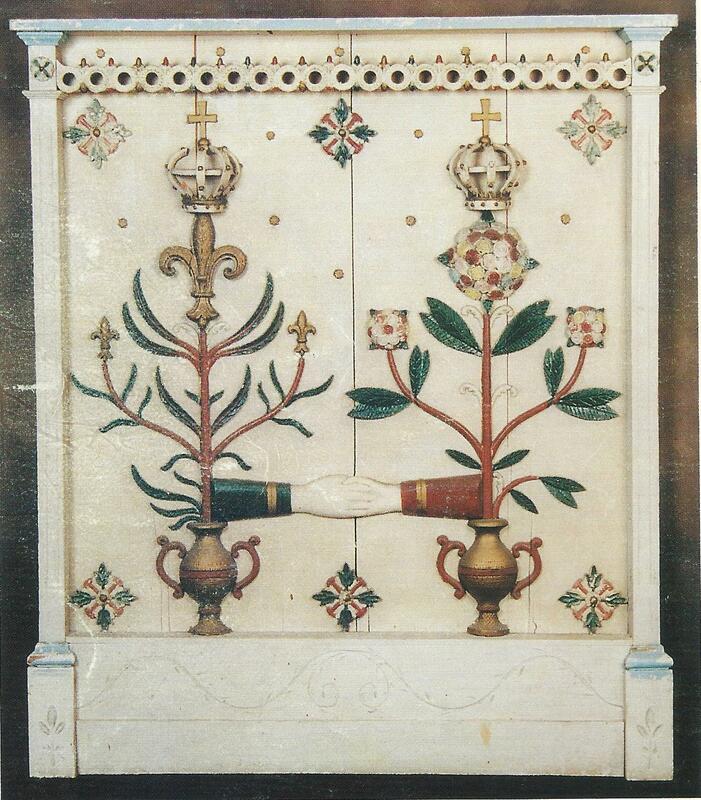 It is a short history of the Bourgault family who started the well known wood carving community of Saint-John-Port-Joli. Even if you know little of Quebec carving, you have probably run across a carving or lamp created by one of these traditional artists. Perhaps at the cottage of a friend. Many people who have visited the community over the years have picked up a memento, and many of these are destined for the rustic summer home. For years I didn’t really gravitate to this work, finding it more craft than art, but I eventually began to see some pieces that I really admired. 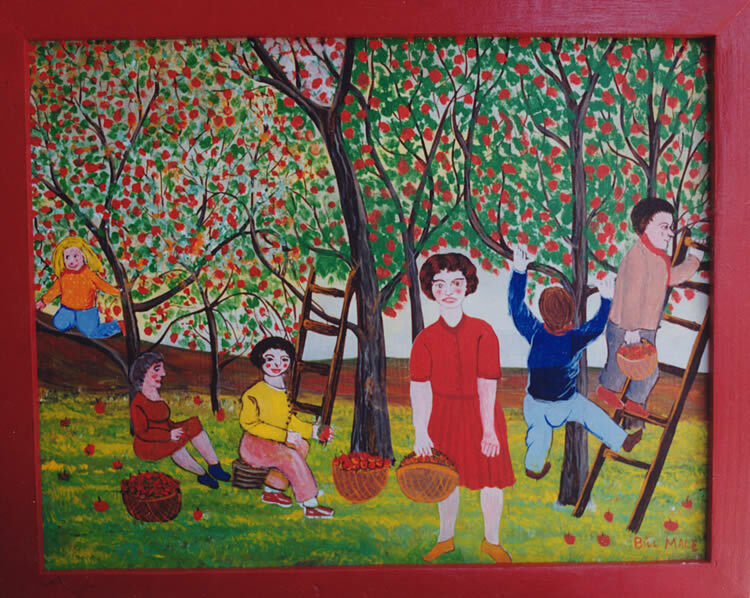 Mostly family or village scenes from Medard, who would on occasion paint the carvings in fine detail. I recall a scene of a Sunday dinner, complete with turkey, and a completely set table. The family looking on as father was about to set to work carving. Both the expressions of the people, and over-all integrity of the depiction made it live for me. Since then I have considered the work more closely. So here is the article, translated to the best of my ability, which serves as a “starter” to the famous Bourgault family, and the carving town of Saint-Jean-Port-Joli. If you google their, or the town’s name you will come up with lots of stuff. Or better still, swing by there and see for yourself. 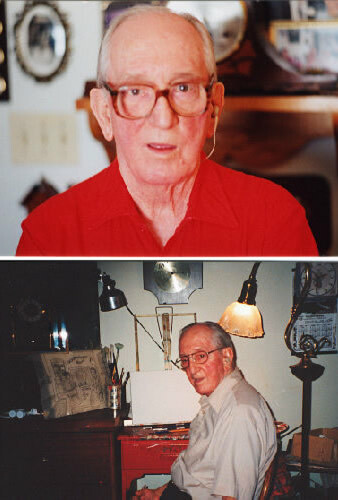 The importance of the Bourgault Family in the world of sculpture in Quebec. Since the 1930s, the Bourgault family of Saint-Jean-Port-Joli has been world renown for wood crafts. The son of a carpenter from Saint-Jean-Port-Joli, Médard Bourgault (1897-1967) began working with wood at a very young age using a simple pocket knife. Like many other young men in his parish, he worked on ships, and his interest in sculpture increased with the leisure hours spent at sea. In 1918, he began to manufacture furniture and sculptures in the paternal workshop. The following year, he transformed an old shed into a workshop and often visited Arthur Fournier, a woodworker, who would guide him. During the 1920s, Medard made mostly furniture, but he also made crucifixes and other religious objects. He earns his living working alongside his father. 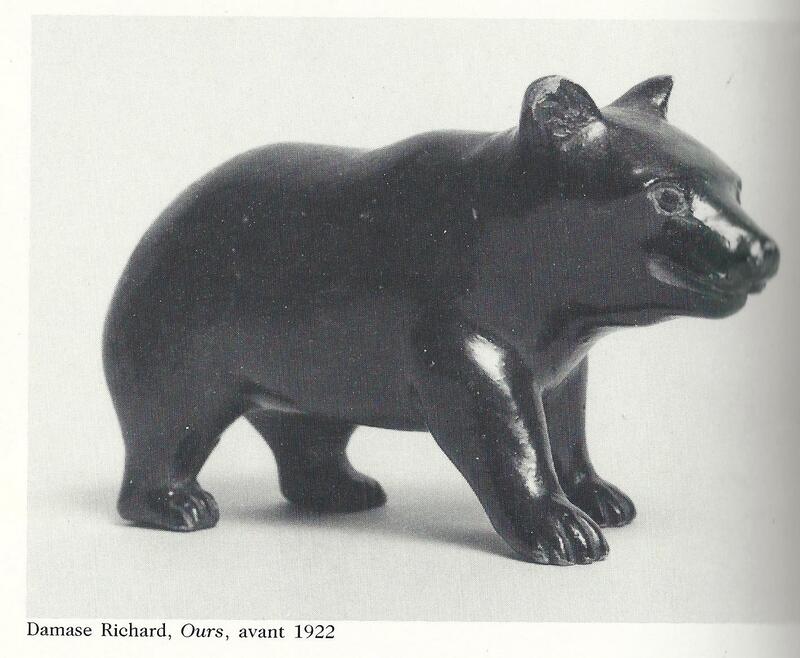 Starting in 1929, Medard’s sculptures became increasingly popular among collectors, who discovered them through the ethnologist Marius Barbeau and the man of letters and politician Georges Bouchard. They are the ones who encourage Médard to revive the local scenes. In the midst of the economic crisis, Medard, for whom carpentry work was rare, opened a craft counter on the side of the road. In 1931, he invited his brothers Jean-Julien (1910-1996) and André (1898-1957) to work with him, and he began to participate in exhibitions in Quebec and Toronto. The Government of Quebec began to buy from the brothers. Without planning it, the Bourgault brothers had revived Quebec crafts. From 1933 on, the three brothers specialized. Medard devoted himself above all to religious sculpture. He made statues for religious communities and carved the ornamental woodwork in many churches. Jean-Julien and André continue for their part to portray the rural peasant culture. Soon their sister Yvonne also joins the company, as well as nephews and other young people from Saint-Jean-Port-Joli. In 1940, the Quebec government transformed the Bourgault brothers’ workshop into a sculpture school, whose management was entrusted to Médard. André became the director in 1952 and Jean-Julien in 1958. From 1964 to 1986, it was the turn of Jean-Pierre, son of Jean-Julien, to assume the direction. Saint-Jean-Port-Joli now bears the name of “capital of sculpture” in Quebec. With the years and the increasing number of local sculptors, the art has diversified and is renewed, as evidenced by the creation of works in resin, stone, granite, clay and bronze. Other forms have been added, including painting. In the mid 1990’s we did what turned out to be a one time show in the Laurentians ski area north of Montreal. During ski season in the club house of a popular ski hill. The assumption was that the multitude of skiers would come off the slopes and couldn’t help themselves from wandering through the show and selecting a few prime antiques for their ski chalets. Turns out this assumption was wrong, and we spent three days watching people ski, and then going directly to their cars and leaving. We rented a chalet with friends and so when we were not busy doing nothing at the show we at least had some good food and laughs in commiseration. 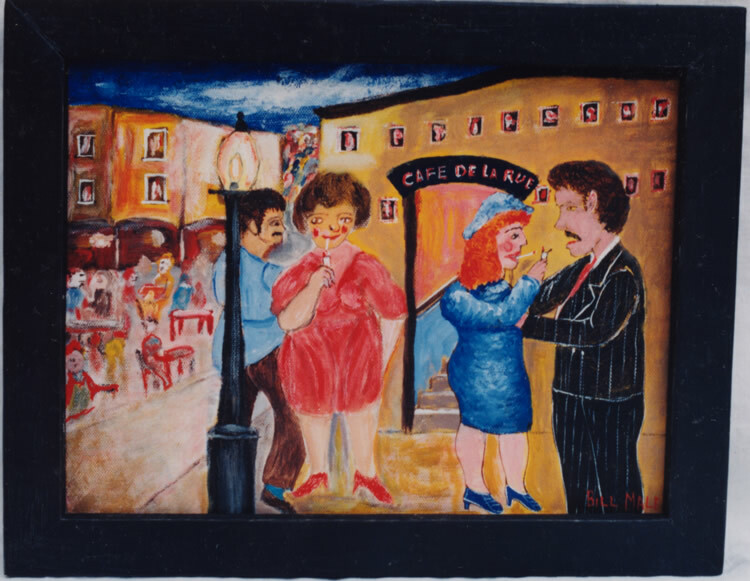 It turned out to be a pretty expensive venture which didn’t really pay off, if it was not for the fact that in being there we came across one of the best and most important pieces of Quebec folk art we had ever encountered. Upon loading in we were struck by an incredibly detailed diorama, about three feet wide by two feet deep and high, on the table of Quebec dealer/collector Serge Brouillard, whom we knew quite well from previous dealings. What a wonderful thing to behold. Looking into this tiny word of snow and maple forest with little finely carved people, instruments, buildings, horses, and even tiny squirrels in the trees, you just loose yourself in the details. A masterpiece which would have taken an amazing amount of time and patience to realize. Completely over the top. We had to have it. It wasn’t cheap as Serge knows his stuff, but it was spectacular, and in the end, how often are you offered a chance to buy spectacular. 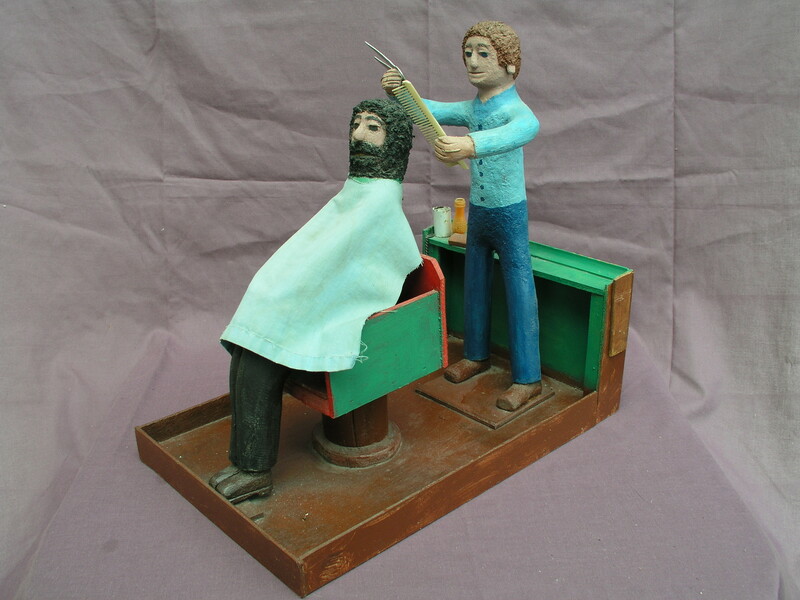 We made a deal and sold it directly to our best customer and most serious collector of folk art. She loves it and continues to be it’s guardian. We visit it once and a while just to go back to that magic place. Fortunately it came with full provenance which is kept with the piece. It’s a fascinating story. I recount it here in English. 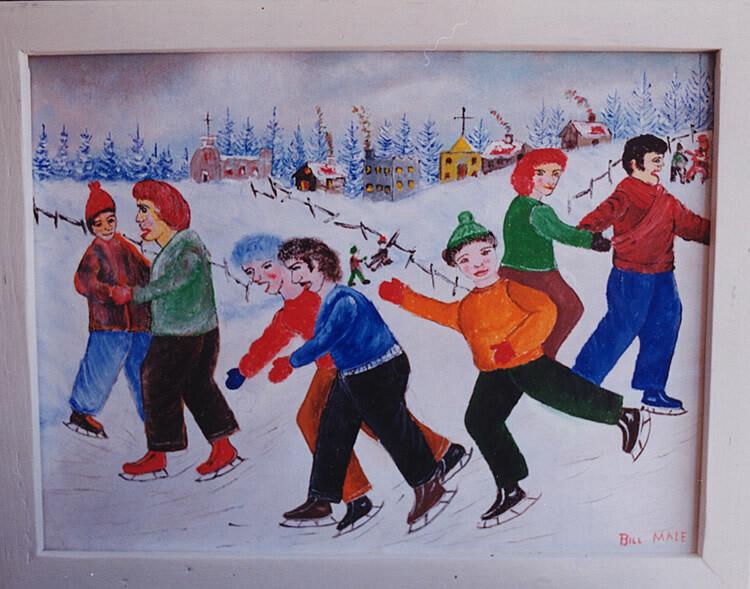 This scene of Maple Sugar Time was realized by Adelard Bronsseau, from St Jacques de Montcalm, Quebec in 1930. He was an exceptionally creative man, very active in many trades (contractor, jeweller, stone carver), when he was suddenly struck by an unknown sickness. The main effect of this sickness, apart from its painful condition, was to keep him from sleeping at night. In order to occupy himself while his family was sleeping, he started carving one by one the figures, the tools, the animals. Which were going to make up this wonderful rendition of a traditional rural scene. The village priest, M. Piette, seeing how his parishioner’s health was declining, took the bull by the horns and declared a “novena” (period of communal praying, usually nine days) for the return of the man’s health. Probably inspired by the words of Voltaire “Work protects man from boredom, sickness, and need”, the priest offered Adelard the following deal, “My dear Adelard, if you regain your health, you will have to give your Maple Sugar Scene to the parish”. Adelard Brousseau agreed, but it was only after many months of prayers and care that he got better. 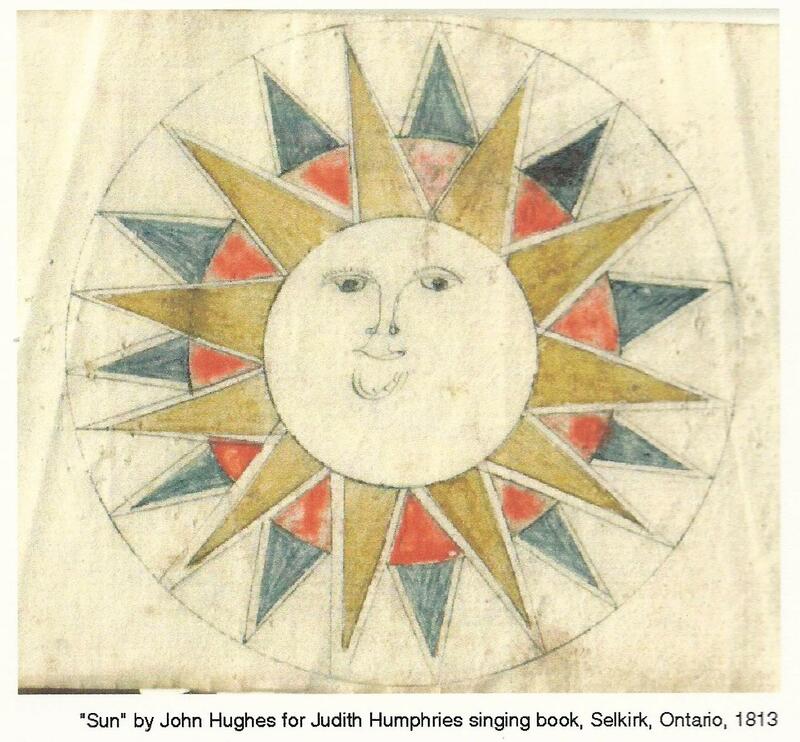 As agreed the scene was completed and turned over to the parish, and it’s new priest Angelus Houle, who was a good friend of the artist, decided to exploit the commercial potential of such a gift, by displaying it for a fee at various fairs, and public exhibitions of the district. 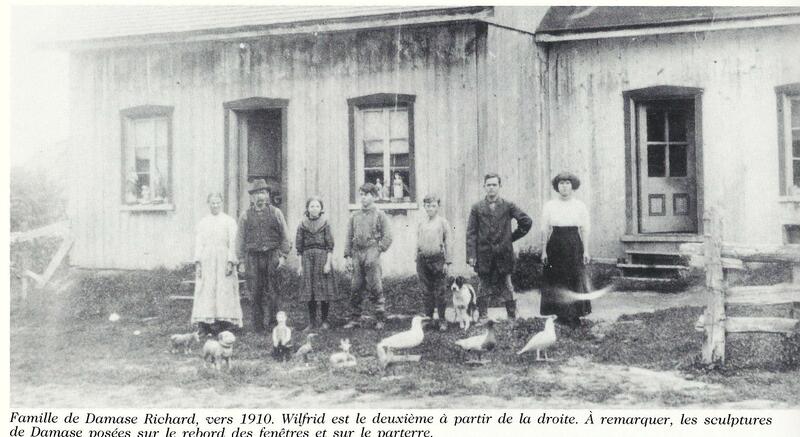 Adelard Brousseau’s daughter, Madam Dion, remembers that when she was a little girl her father’s Maple Sugar Scene was a great attraction at the fairs, and people would line up to view it, in spite of the high entrance fee for the time: (10 cents for children, 25 cents for adults). 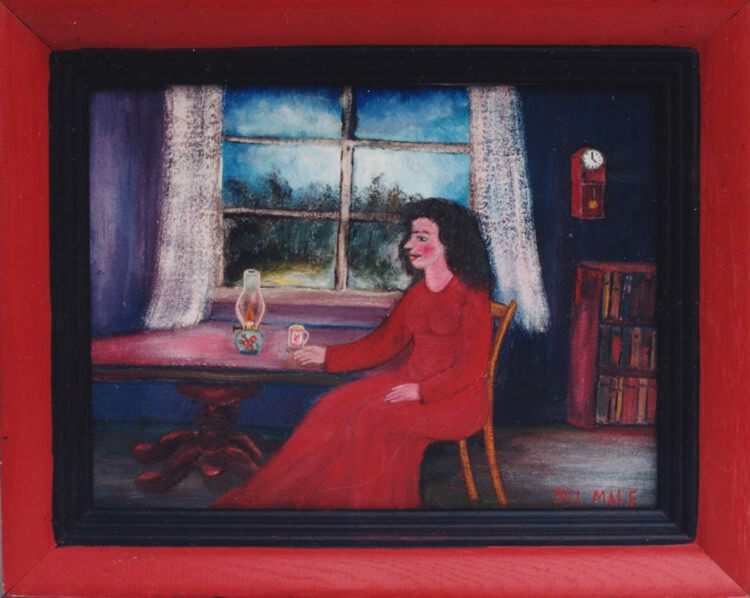 Madam Dion relates that sadly she did not have the means as a child to view “the masterpiece that her papa had created at night, in his dark little workshop”. She had seen the miniature figures dressed in woolen cloths, the horses, the carts, the buildings, but never the whole scene in its actual presentation. Many years later in June 1992, the Maple Sugar Scene is only a vague childhood memory for Madam Dion, when suddenly it is brought back into her life by a telephone call from a nun named Sister Therese who explains that she had bought the scene from Angelus Houle, a long time ago, on the understanding that she would eventually return it to the artist’s family. The time had come to fulfill this promise, and she was ready to deliver the piece to Madam Dion. And so it is that Madam Dion recovers a wonderful part of her personal heritage, which she can now admire at her leisure. 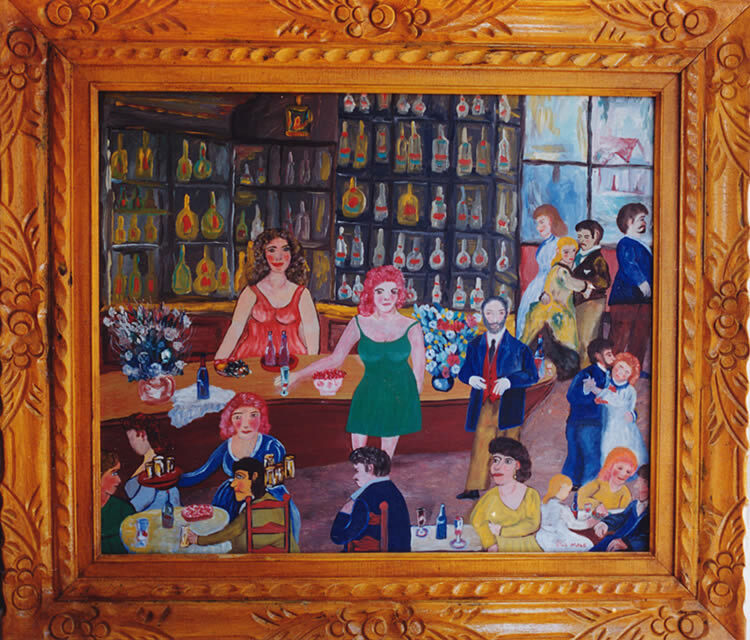 Madam Dion kept her father’s masterpiece for three years. When she decided to sell her house and move into an apartment, she also had to sell the Maple Sugar Scene, which was too large for her new space. 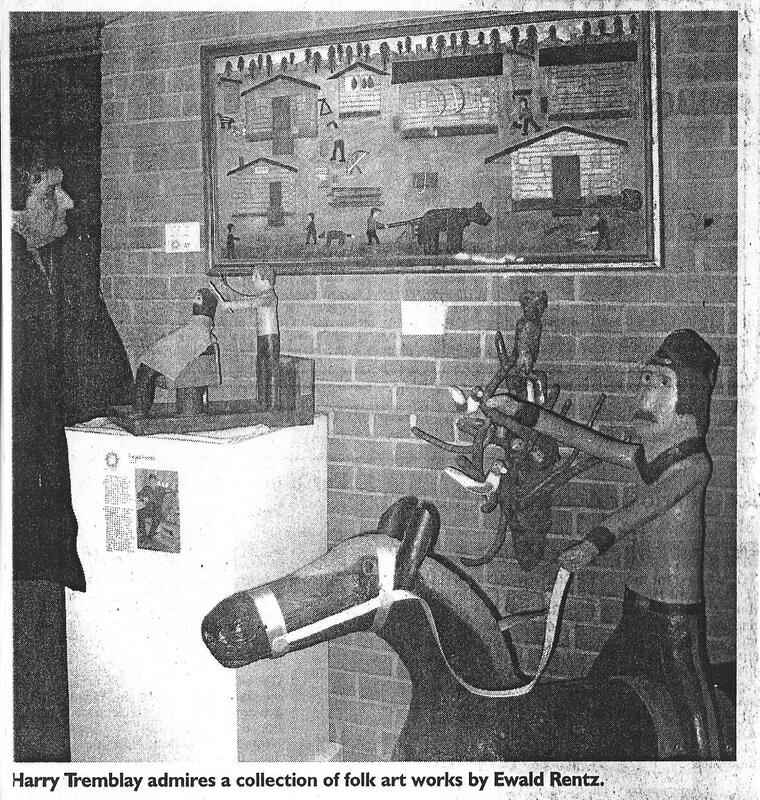 We first met Pierre Laplante when he participated for one time in the 1997 Bowmanville Spring Folk Art and Antique show. We set up just down the aisle from him and before the show was over we had gotten to know each other through many friendly exchanges, and also he bought a giant lumberjack that was our show stopper to put in his indoor pool area at his rural home. Nice fellow. 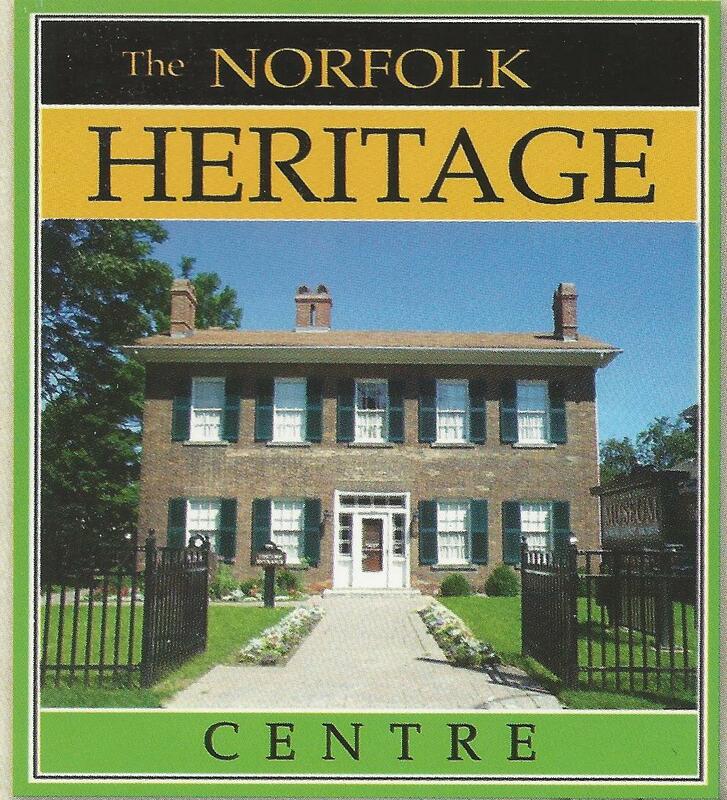 It was announced at the show that Bill Dobson was managing an auction of Pierre’s collection on May 17 and 18th, with auctioneers Tim Potter and Cec Knight in Kingston. 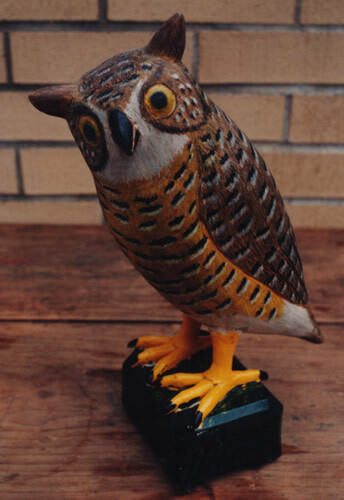 It was exciting news as Pierre had a reputation as a very serious collector of Quebec folk art. We had heard many stories from the pickers in Quebec of the dentist from Montreal that would buy almost everything that they would bring to him. Often this was said in the form of an apology for not having anything to offer us. If you have the money and the will this is a very effective way to collect. Once a few pickers know they can rely on you to buy almost anything they bring you, they will put in a special effort, offer everything to you first, and as they say be happy to “make hay while the sun shines”. It was rumored that after a few years of collecting this way, the barn and out buildings at his weekend farm in the La Prairie region south of Montreal were chock full of wonderful stuff. 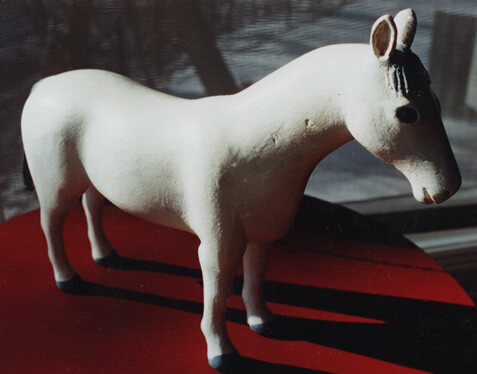 Folk art was still a very strong market in 1997 so when the auction came, we broke open our piggy bank, and went loaded for bear. Well said Pierre, and the massive, well organized, two day auction saw many such pieces make their way into some important collections, while realizing some pretty phenomenal sale prices. We were able to buy a lot of stuff. 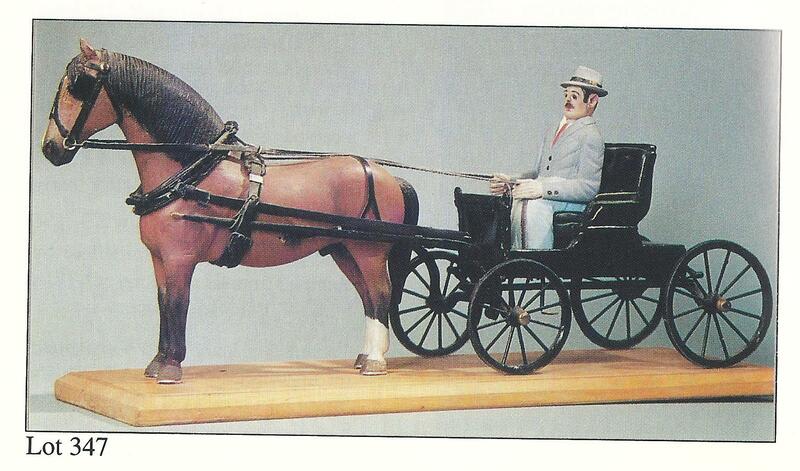 We paid relatively big money for some things like this Lucien legare horse, buggy and driver at $750, but with so much on offer we were able to scoop up many bargains as well. 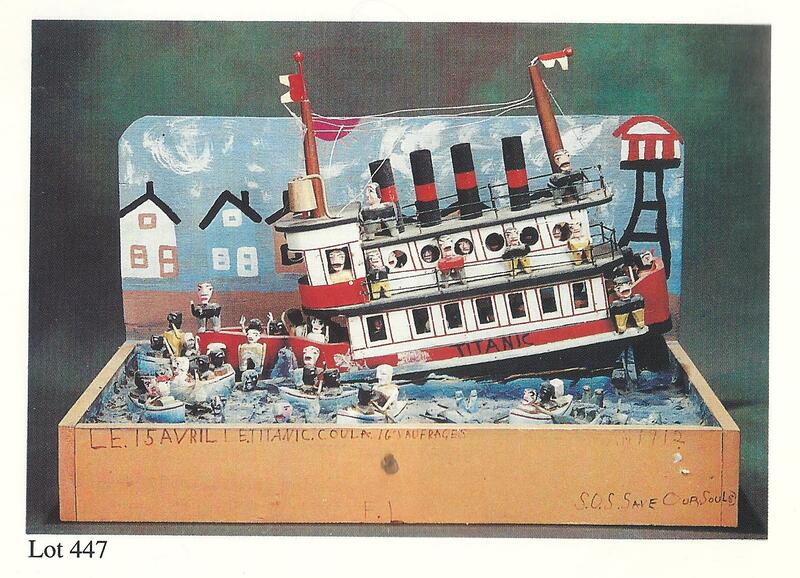 Like this Felicien Levesque tableau of the Titanic sinking at $625. Well under the money. 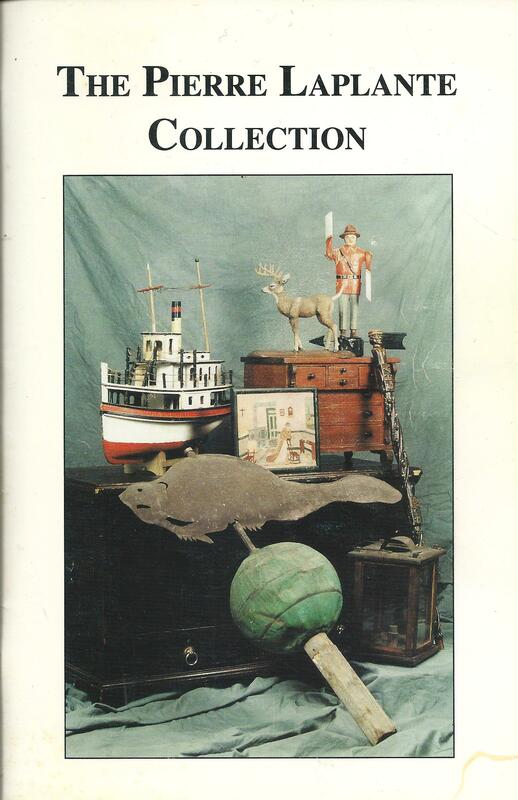 Things started out modestly with maple sugar molds, and smaller carvings and accessories going in the expected $200 t0 $400 range, and then people started paying attention when lot 161, a painted whirligig Mountie which is illustrated on the cover went for $900. 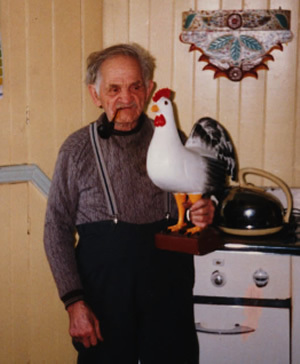 Soon after a tin rooster weather vane in old white paint realized $1,250. 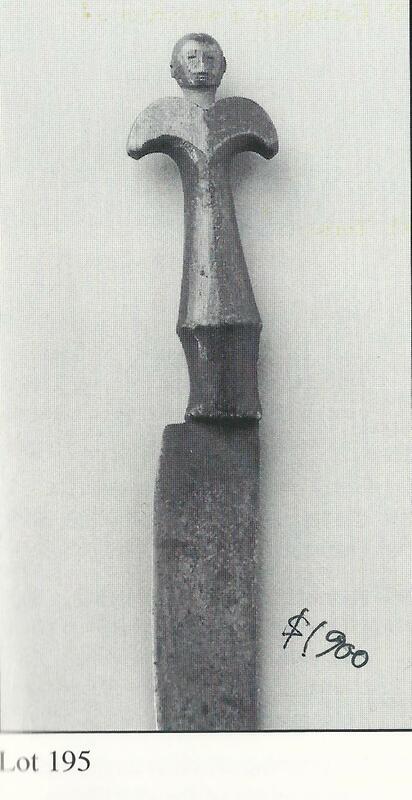 Then lot 195, a knife with carved wooden handles in the form of a fleurde lis with a man’s head brought $1,900. Things were moving. 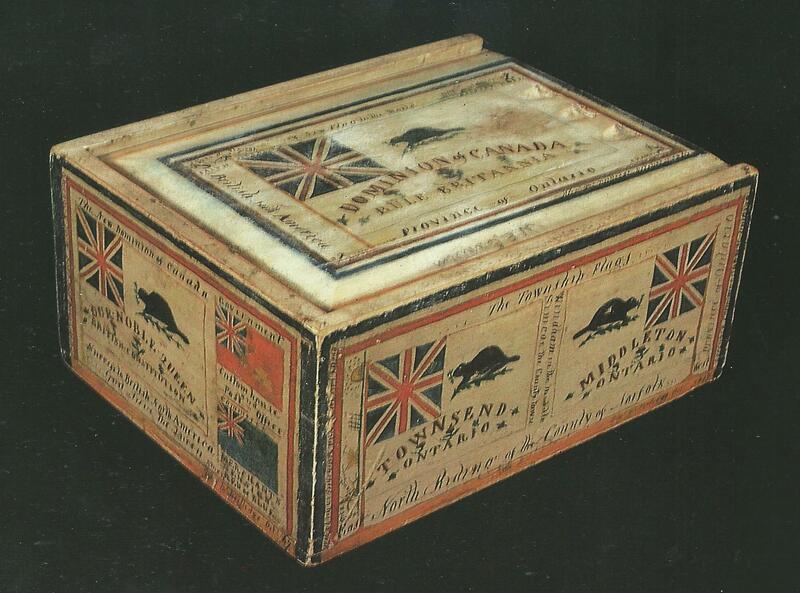 There were a few gasps when a beautiful Nova Scotia document box from 1914 with interlocking hands, hearts, stars, and leaves went for $1,900. Followed shortly after by an oil on glass painting of tugboats on the Saint Lawrence attributed to Captain P. Carbonneau which saw $2,500. An Alcide St Germain hanging flying goose achieved $1,000, and the tone was set. Here’s a couple of the highlights. There were many more. 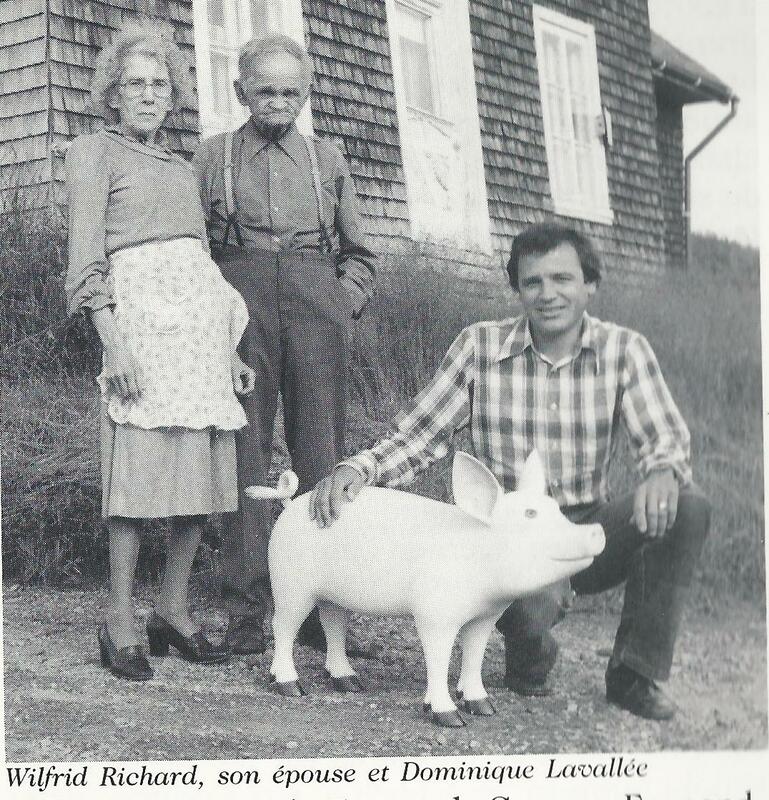 We went on to establish a relationship with Pierre after the auction and were invited to visit him and his wife at their farm. We had a wonderful evening of laughter, good conversation and an excellent meal, and we even enjoyed the adventure of climbing up the tiny ladder to the second floor guest room of the century old farm house. I made sure my bladder was empty though because I didn’t fancy climbing down in the dark to find the washroom. We realized that for as much was sold at the auction, he had twice as much great stuff still in his collection. We even had a chance to say a quick hello to our lumberjack friend in his new residence by the pool.